Celebrity chef, television personality and best-selling author, Giada De Laurentiis brings her extensive culinary experience to Las Vegas with her first restaurant. Located on the second floor of the Cromwell, Giada will be its exclusive marquee restaurant. Inspired by Giada's personality and style, the restaurant will offer a modern, yet sleek design with clean lines and pops of color. 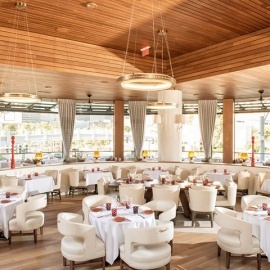 The restaurant features a comfortable, warm and welcoming charm, open kitchen, living room-style furniture, and giant retractable windows which open to the strip to provide natural light, breathtaking views, and a unique energy reflective of Giada. The al fresco dining, beautiful exhibition kitchen, and signature antipasto bar welcome guests as they arrive into the restaurant where skilled chefs prepare fresh pasta, antipasto platters, and thinly shave prosciutto to order. The cuisine will embrace her birthplace of Rome, mirroring her passion for Italian cooking with vibrant, Californian influences made famous in her cookbooks. Signature dishes such as lemon spaghetti, eggplant rollatini, marsala herb chicken meatballs and lemon ricotta cookies will be available to guests daily for breakfast, lunch and dinner.